Johannesburg, 7 August 2018 – The Steel and Engineering Industries Federation of Southern Africa (SEIFSA) welcomes a second consecutive increase in output of the metals and engineering (M&E) cluster in two months, SEIFSA Economist Marique Kruger said. Speaking after the release of the latest preliminary seasonally-adjusted data, Ms Kruger said the increase in production in June, which follows a similar upward trend in May, is welcome, despite lingering concerns about the possibility of a lower-than-expected contribution of the broader manufacturing sector to gross domestic product (GDP) in the second quarter of the year. “The data, released by Statistics South Africa today, captures an increase in output in the sub-industry, in line with the broader manufacturing sector, which also increased by 0,7% in June 2018 when compared with June 2017. After adjusting for the sectoral weights, the data indicated that production in M&E sub-sectors increased by 4,1% in June 2018 on a year-on-year basis, and by 2,4% on a month-on-month basis,” Ms Kruger said. She said notwithstanding the general increase in gross output, concerns remain that the contribution of the cluster and the broader manufacturing to GDP is still negligible because of proportionately higher intermediate input prices and production costs, including fuel and energy costs. Ms Kruger said input prices can be very volatile because of factors affecting supply, including the unpredictable exchange rate. Moreover, the demand for intermediate input tends to be more price inelastic, with overall demand remaining about the same whether input prices increase or decrease. She said this made it easier for suppliers to pass on frequent price increases to producers or buyers since their demand remained more or less the same, thereby accounting for the volatility in input prices. She said the rapid depreciation of the rand-dollar exchange rate also increased the price of imported intermediary inputs and adversely affected the M&E cluster’s contribution to GDP. Nevertheless, Ms Kruger said the improvement in gross output augurs well for local producers, amidst escalating trade war rhetoric as the US and China continue to exchange threats of further tariff increases. “The expectation is for the positive output trend to continue in July 2018 in line with an improving domestic manufacturing index, which rose to 51,5 in July from 47,9 in June, signaling an expansion in local production activities. The improvement in the local manufacturing purchasing managers’ index to an expansionary territory aligns with the global manufacturing index, which continues to perform well at 52,7, remaining above the neutral 50-point mark for a sixth consecutive month,” she said. Ms Kruger said a positive local output growth trajectory – which is consistent with global trends – bodes well for the M&E cluster. She promised that SEIFSA would continue to monitor the trend. 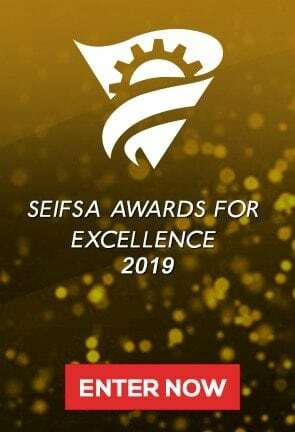 SEIFSA is a National Federation representing 23 independent employers. Associations in the metals and engineering industries, with a combined membership of 1600 companies employing around 200 000 employees. The Federation was formed in 1943 and its member companies range from giant steel-making corporations to formed in 1943 and its member companies range from giant steel-making corporations to micro-enterprises employing few than 50 people.